In a statement last year, Simon Fürst, AUTOSAR Spokesperson said, “With Release 1.0 of Acceptance Tests, AUTOSAR is proud to announce the expansion of its activities with a means of testing a configurable AUTOSAR implementation.” In the following, Fürst gives a brief overview of the Development Partnership’s new Standard Acceptance Tests, and what they mean for automotive engineers moving forward. AUTOSAR (AUTomotive Open System ARchitecture) is a worldwide development partnership of automotive manufacturers, automotive suppliers, tool vendors, and semiconductor vendors and other companies from the electronics, semiconductor, and software industries. Founded in 2003, the “core partners” consisting of the BMW Group, Bosch, Continental, Daimler AG, Ford, General Motors, PSA Peugeot Citroën, Toyota, and the Volkswagen Group, began working on the development and introduction of an open, standardized software architecture for the automotive industry. The idea: Simplify the exchange and update options for software and hardware through an approach that forms the basis for reliably controlling the growing complexity of electrical and electronic systems in motor vehicles. Today, the partnership’s major product is the AUTOSAR Classic Platform, an open software framework that targets automotive electronic control units (ECUs). At the end of 2014, AUTOSAR released the first version of Standard Acceptance Tests (Release 1.0). 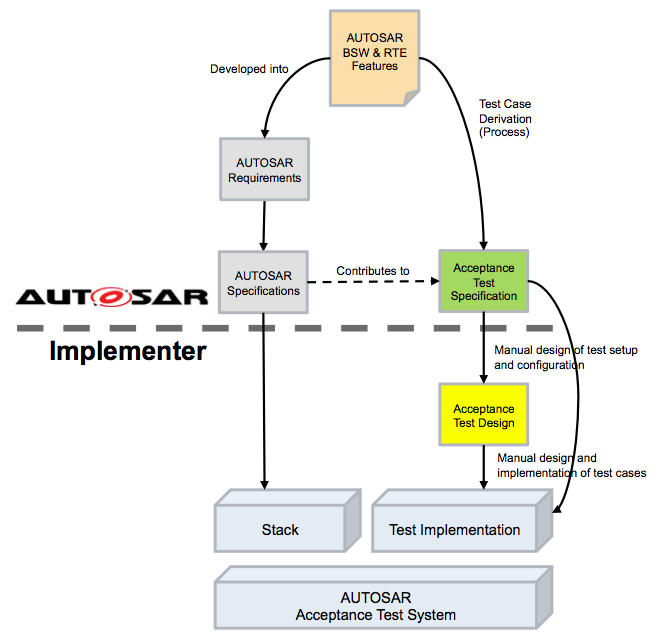 These acceptance tests, written at the specification level, intend to validate the behavior of a configured implementation of the AUTOSAR Classic Platform at its interfaces (Figure 1). Executing the tests validates the interoperability of the basic software stack-under-test with AUTOSAR application software components on the one hand, and interoperability at the vehicle network level on the other. Figure 1: The AUTOSAR Acceptance Tests Specification defines black box tests for ICC1 configurable stacks, providing test cases for areas of high need in the automotive market such as Communications (CAN, LIN, FlexRay), Diagnostics, NVRAM, Mode Management, and RTE. This first release of acceptance tests includes test cases for the Run-time Environment (RTE), basic software services (NVRAM Manager, Diagnostic Event Manager, Diagnostic Communication Manager, ECU State Manage,r and Communication Manager), bus behavior (communication on CAN, LIN, FlexRay, generic features of the communication stack), and bus protocols (transport protocols, network management). The AUTOSAR Acceptance Tests Specifications respond directly to an important market need of the automotive industry by enabling an OEM’s acceptance of a supplier’s platform at a bus and application level. The Standard Acceptance Test releases will be managed separately from the traditional AUTOSAR releases, which include specifications for Basic Software, Methodology, and Application Interfaces. This allows for specification growth according to the needs of the 170 AUTOSAR partners. In 2015, for example, a second release is planned that will enlarge the scope of the tests with regard to Ethernet. Standardization of test cases: Allowing the exchange of reliable test results. Test cases can be applied once for multiple customers so they do not have to be executed by both supplier and customer. Common test development and maintenance: Providing significant help for users as they no longer have to specify and maintain test cases of their own. Definition of a universal methodology: Enabling the extension of the standard test suite with user-specific features. AUTOSAR Acceptance Tests do not mandate a specific business model. Test case specifications can be integrated for multiple AUTOSAR stack implementations or for a specific one, and can be executed by different market partners (e.g. OEM, Tier 1, Tier 2, or an independent test laboratory). Companies that join the AUTOSAR Development Partnership can use the specifications free of charge. Simon Fürst is General Manger of Software Development and Software Infrastructure at BMW AG in Munich, Germany, and Spokesperson for the AUTOSAR Development Partnership.